This book reviews the principles of Doppler radar and emphasizes the quantitative measurement of meteorological parameters. 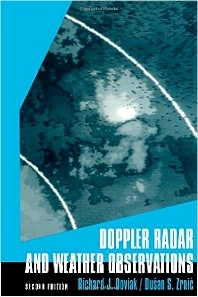 It illustrates the relation of Doppler radar data and images to atmospherix phenomena such as tornados, microbursts, waves, turbulence, density currents, hurricanes, and lightning. Radar images and photographs of these weather phenomena are included. CONTENTS: Introduction. Electromagnetic Waves and Propagation. Radar and Its Environment. Weather Signals. Doppler Spectra of Other Signals. Weather Signal Processing. Considerations in the Observation of Weather. Precipitation Measurements. Observations of Fair Weather. Appendices. Index.